"Jehan Stynebec" maintained a lifelong devotion to the 15th-century minor hoodlum and "knyght presoner, sir Thomas Malleorre," and long cherished the idea of retelling the Matter of Arthur for our time. Dating mostly from 1958-59, Steinbeck's fragmentary attempt represents both an earnest effort at scholarly perspective and a broad contemporary reinterpretation. He did not try to "translate," but simplified and condensed Malory's language while tidying up some narrative loose ends. There are five brief, fairly straightforward versions of episodes from the first book (following Eugene Vinaver's edition of the Winchester MS) and two lengthy narratives based on the Tale of Sir Launcelot du Lake and the Gawain, Ywain, and Marhalt episode. The brief pieces are usually best when closest to Malory; the fog-over-the-moors flourishes and frequent sententious interpolations rarely come off. And Malory's blunt, clear prose rhythms find little counterpart in Steinbeck: "And only then did the knights look about them. On a smooth dark water they saw a little ship covered with silken cloth. . ." for "Than the kynge loked aboute the worlde and sawe before hym in a grete water a lytyll shippe all apparayled with sylke downe to the watir." The two long pieces are freewheeling, often playful reworkings of Malory, in which Steinbeck tries to sum up his complex love of all that knighthood and the Arthurian fellowship have meant to him. Here the dominant mode is the arch and whimsical fable, much in the vein of Pippin IV, bound to enthrall and exasperate equal numbers of people. The book must be evaluated more as Steinbeckiana than as Arthuriana, not so much for its narrative foibles as because the project remained so fragmentary--including neither the Grail quest, the book of Launcelot and Guinevere, nor the Morte Arthur. 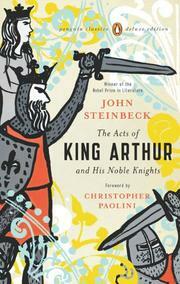 A complete Arthurian cycle from Steinbeck would have been good to have. The present version remains an erratically charming curiosity.